šxʷʔam̓ət (home) is a production with big aspirations. Directed by David Diamond from Theatre for Living, šxʷʔam̓ət is broken down into two sections. The audience observes the first part part as a traditional play, and then in the second much-longer interactive section, are invited to actually take part. Taking inspiration from Augusto Boal’s Theatre of the Oppressed, Diamond’s work seeks to not merely use theatre just to illustrate and tell a story, but also as a tool of social change. šxʷʔam̓ət—co-directed by award-winning Salteaux/Cree writer, producer, actor and documentary filmmaker Renae Morriseau—featured a mixed Indigenous and non-Indigenous cast including Snuneymuxw actor Sam Seward (Nekwimetstn). The play showcased a variety of interwoven mixed-cultural storylines. The motivation behind the play came from a sense that he needed to take responsibility, he acknowledged. 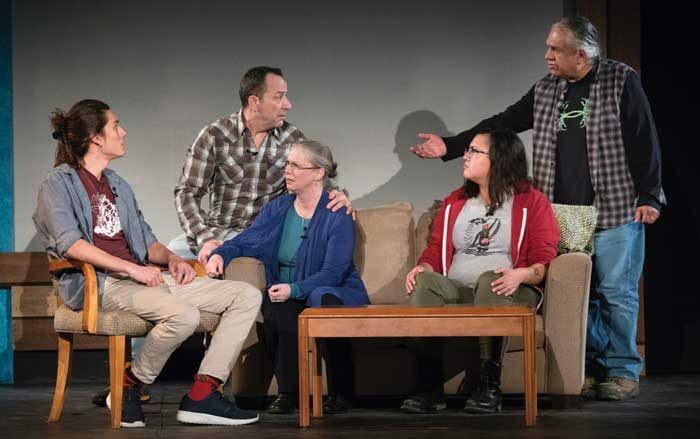 It was with that sentiment, and with respect paid to the residential school survivors in the room, that the initial half-hour portion of the play began. At a crucial point in the action, the story stopped, and the house lights came on. At this point the next portion of the show began, in which the play would be re-enacted, but with the opportunity for audience members to shout “stop” at any point, take the place of an actor onstage, and play out how it could go differently. It was clear that there was immense collaborative effort to create the stories in šxʷʔam̓ət, and both writing the directorial finesse exercised by Morriseau and Diamond resulted in realistic characters that weren’t just caricatures of cultural stereotypes. 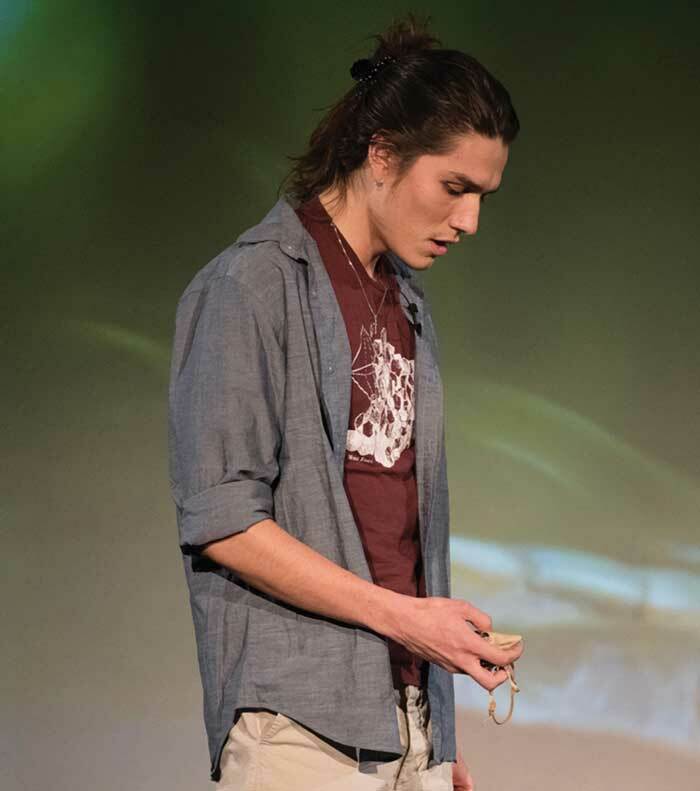 In one scene, the character Lucas (played by Asivak Koostachin) struggles with understanding his Indigenous heritage, which has been kept a secret, after being gifted a medicine pouch from his friend Siya (Madeline Terbasket). His adopted mother Sarah (Rev. Margaret Roberts), a white minister, takes the pouch from him and refuses to return it. At this point in the re-enactment the play was stopped and an audience member took the place of Sarah. In the discussion that ensued, people talked about the mother’s fear of losing her son and spoke of the son’s right to know the truth about who he is. Of course, not every issue around colonization and reconciliation can, in Diamond’s words, “bubble up” in the limited timespan of one play (though it did go on for almost three hours). However most of the audience members who participated appeared to be non-Indigenous, and it seemed like much of the conversation remained on a surface level. It brought up some uncomfortable realities about how far we must come in society in order to truly reconcile, and perhaps education is the first step so that we can go deeper. The concept of “reconciliation” itself has become watered down and co-opted by government and corporations. It is also often presented as something that “both sides” need to come together on, ignoring the harsh and ongoing realities of colonization and oppression. šxʷʔam̓ət will be shown in Vancouver from March 2 to 10, wrapping up with a live, global, interactive webcast showing on March 10. More information as well as the webcast be found at www.headlinestheatre.com.